All you need to run your factory ! 0 results. Did you mean ? The mold controllers of the 210 H6/12E range operate with oil up to a temperature of 210°C or 250°C (option). The temperature controllers are equipped with a 60L/min magnetic coupling pump with max 5 bars of pressure, a heat plate exchanger (spiralled) and offers 6 or 12kW of heating power. Control is ensured by a self-tuning microprocessor controller. The heaters have no contact with the oil in the tank, which prevents accelerated deteriation (cracking). Addtionally these and other parts are easily replaceable (emptying is not necessary), resulting in facilitated maintenance. Options include flow meters, remote communication, manual bypass, solid state relay and custom colors, among others. Versions equipped with machine communication capability can directly download mold data and alarm signals from the injection molding machine control panel. 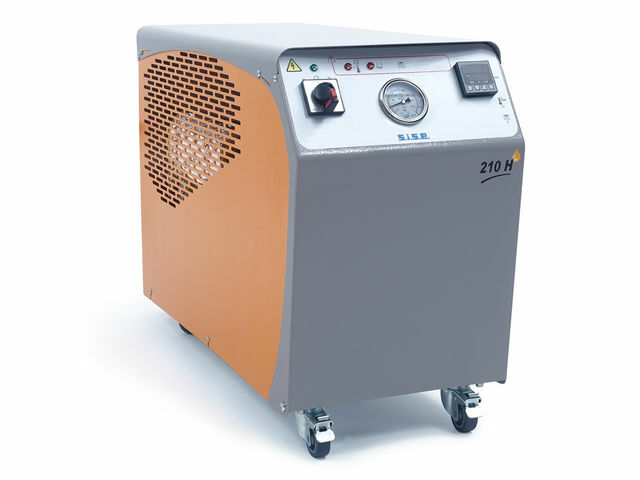 All high temperature applications that require a heating power of up to 12kW (mid-sized molds, dual-layered tanks, calendering, heating tables, relatively fast rise in temperature, control of fluid process for chemical, petrochemical, and pharmaceutical industries, and particular temperature conditions. Complete your request and let our teams find you the best deals available. List your products and services to enhance your web presence and receive qualified enquiries. Industry's new products straight in your inbox! Industry Plaza: products, services and industrial equipment. Portal and virtual trade fair for the industry, with Industry Plaza you will compare the products and get in touch with industrial suppliers, in order to get free quotes or information. Make your purchases easier for your business.